Former Hibernian captain Ian Murray does not think the Edinburgh club are in serious danger of relegation from the Scottish Premiership. The Easter Road side have gone eight games without a win following Monday's 2-0 defeat by Aberdeen. Hibs are seventh in the table but are only four points clear of the relegation play-off spot. 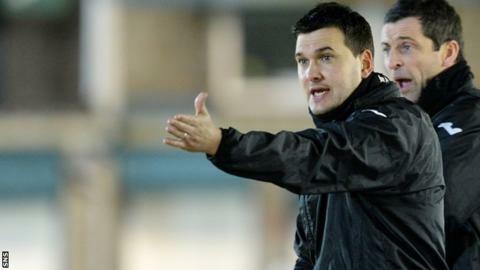 "I don't fear too much for them at the moment, but that can change in the next few weeks," said Dumbarton boss Murray. "They need to look at the positives and say they are in a mini-league with five others and, at the moment, they are top of that mini-league. "Worst-case scenario, they finish bottom of that mini-league and still have another two games to save themselves in the play-offs. "So it would take a remarkable turnaround for them to find themselves in the Championship next season. "But results haven't been great and, in the next few weeks, if they don't pick up a win, you really don't want to go into the last two or three games with a lot of pressure on you." Terry Butcher took over as manager of Hibs in November, but his arrival has not brought the improvement fans were hoping for. Murray is in no doubt the Easter Road side have been under-achieving for too long. "I'm sure, looking at the table around December and January, Terry probably thought there were enough points in the bag, and certainly more than enough points available, that he could bring in a few loans to get him over the line and then address the situation come the summer," added Murray. "When you look at the club and its standing in Scottish football and then you look at the training facilities, and you look at Edinburgh as a city, I think it's strange that they can't attract, I'm not saying better players, but certainly the calibre of player that would put them in the top six, especially when you look at other teams managing to do it. "It's a club that should be challenging for the top six and, if we're being really brutal about it, top six is the minimum that they expect."